Ovaries make follicles that hold eggs. 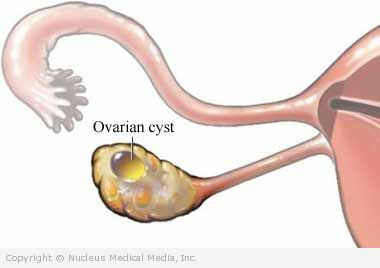 With PCOS, the ovaries make the follicles, but the eggs do not mature or leave the ovary. The immature follicles can turn into fluid-filled sacs called cysts. Most women with PCOS have cysts. But women with ovarian cysts do not necessarily have PCOS. The cause is unknown. Genes may play a role. The problem is related to insulin resistance that creates high levels of insulin. These high insulin levels cause too much androgen from the ovaries. This prevents ovulation and leads to enlarged, polycystic ovaries. The doctor will ask about your symptoms and medical history. She will ask questions about your periods and when they first started. The doctor will also perform a physical exam, including a pelvic exam and a measurement of your body mass. A pelvic ultrasound may also be done to look for multiple cysts on the ovaries. Treatment differs according to whether you want to conceive or not. Treatment targets the underlying insulin resistance that accompanies PCOS diagnosis. Get regular screenings for diabetes, high blood cholesterol, and fat levels. Birth control pills regulate periods. Also, by causing the uterine lining to shed regularly, they reduce the risk of overgrowth or cancer. They also control abnormal hair growth and acne by supressing androgen. Other hormones (called progestins) may also be used to regulate menstruation. They can be used monthly or intermittently. Fertility drugs may be given instead to stimulate ovulation in women who want to become pregnant. PCOS can be prevented by recognizing those at risk during their teen years—due to family history, irregular periods, and obesity. It may be possible to avoid PCOS if the causes of obesity are addressed successfully and you follow a special diet and exercises.